Oh. No. I didn't know. Thank you. For the restraint. By the way. I'm convinced. By your anecdotal. Hold on, I'm just going to grab those undercover photos I had some FBI agents snap of my business card sting. I should be back about the same time we get those results back from JD Power & Associates on business card satisfaction amongst practicing lawyers who often interact with law students. In the meantime, here are some comprehensive statistical analyses of the benefits of basic personal cards to feminine hygiene product 1Ls of all shapes and sizes. My previous statements indicated that I saw both advantages and possible disadvantages to business cards. The fact that caustic Cady has spoken to real, as opposed to fake, lawyers who support business cards for law students is completely consistent with my previous statements. "Some people like it, some people don't. Hard to judge whether it's good." "But -these- few people like it, so it's good (you idiotic moron)!" I'm not the one looking for "evidence"; it was a side comment that was misinterpreted, I suppose. The point was that, if Ender is looking for evidence, I'm not sure whether Ender would want to take Cady's support as such. I know I won't. phew, a lot of heated debate over business/calling cards. I agree it can really air on the side of pretension (like who is this kid giving me his 'card') but by the same token, I agree it's a handy/professional/chic thing to have in the situation Cady listed. I had considered getting some personalized stationary done at Smythson a year or two ago but then I remembered I never write letters and it would just sit around collecting dust. There are loads of great smaller graphic designers who make really interesting and beautiful cards for less than Smythson (you can find some on Etsy or poke around the Daily Candy online archives) and it might be worth ordering a small batch from one of them and then having them on you and see if it you use it or comes in handy. If not, no big monetary loss. I personally like brown suits, and I also think brown in all it's varying shades is one of the most flattering tones for a large variety of people, but by the same token, having a really rich chocolate-y suit I think can come across to some as a bit dandy. Depends on your sartorial nature and firm I suppose. 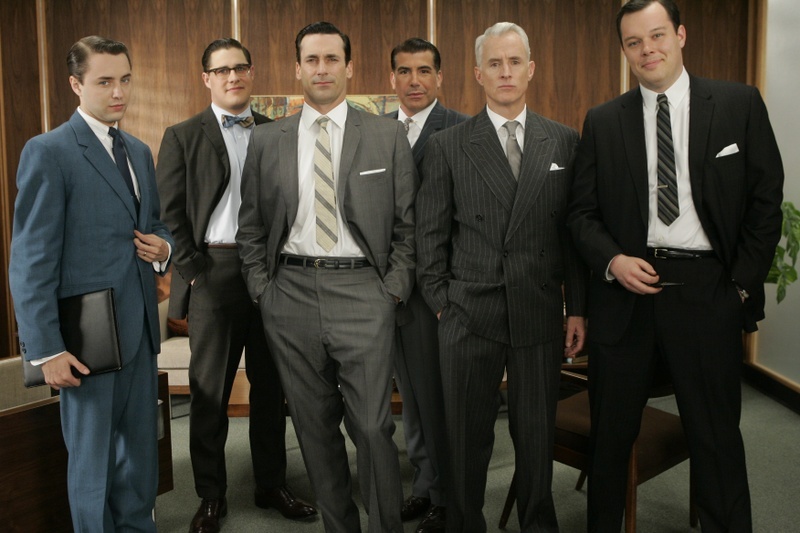 I simply LOVE the fit and cut of Mr. Don Draper's suits on Mad Men. The square edged white pocket square is so perfect. I also like how close cut a lot of the suits are. So many men wear big boxy oversized suit jackets and it's just bleurgh. I mean, the styling on that show is amazing and it helps that a 60's silhouette is on trend at the moment, but still. Great great suits on that show. There actually is a subclass of business cards called personal cards or some such euphemism. I wouldn't call it "pretension pain," simply an aversion to coming across as blatantly premeditated when I'm in fact trying to give a good appearance. I try to put myself in a judge's shoes: How would I react if a 1L handed me a "personal card" after our lunch? Part of me thinks it's professional and efficient; the other part believes it's contrived, unnecessary and, yes, pretentious. The more people piss their pants about business cards, the harder I laugh. It's very simple. A nice, plain card that makes it clear you're just a student looking to get your number out there is a great boon, as long as you have the common sense to hand it out in the right situations. You don't randomly pass it around -- you bring it out when asked for a number, or when receiving someone else's card at mixers/clear networking events. But by all means, 0Ls/newly minted, one-week old 1Ls, keep bleating! I sure as hell am not addressing you personally, unless you feel somehow aggrieved by "0Ls/newly minted, one-week old 1Ls". Note that the business card debate has been raging since early this year, and that there are a few other threads dedicated to this very subject. Further, I still fail to see what "evidence" you would like provided regarding business cards (oh yeah, for Ender's sake ) that wouldn't amount to anecdotal evidence. Please, enlighten me. Unless you're the ultimate arbiter of what anecdotal evidence is sufficient and what is not. That would make a lot of sense. Finally, I'm amused by your paraphrase of the arguments. It's always fun reinterpreting yourself for others, eh? I initially wasn't even making an argument--you were. I simply expressed essentially what Meggo did: an opinion (and an opinion that wasn't even firm at that). You then rolled up your forum sleeves and got to work setting the "bleating" 0Ls straight. Does confrontation surprise you after you imply people are animals? We could point and counterpoint till Halloween, but to be honest, this just isn't that important to me. I addressed your oddly aggressive argument and still am not convinced that 1Ls handing out business cards are indisputably right. I'll have to let it rest there. Also, I don't know I recommend getting a real nice white custom fit shirt and some really awesome shoes and a belt to match. Shoes are ever important and people instantaneously notice nice shoes. But again this is purely a luxury purchase as they are quite expensive, but just thought I would throw that out there. If you are looking, I recommend taking a look at Allen Edmonds. They will last you a lifetime. I beg to differ. Have you ever seen the movie Shawshank redemption? Crucial point in my last post: "I sure as hell am not addressing you personally..."
Does confrontation ever surprise me? No. Did you happen to jump into a debate that has far deeper contextual roots on this forum than you perceived? Yes. Do I care if you're convinced? No. Do I know it works, not only from my own experiences, but from the myriad experiences of others in the field? Yes. Is it odd that you would interpret "bleating" as an implication that other posters are animals? Definitely. Is it surprising given your earlier paraphrase of the argument? No. Does any of this matter to me? No. Are you going to respond in a poor attempt at mocking this question/answer pattern? Probably. Would that show a lack of creativity? Yup. Have you now been preempted, which will leave you feeling like a fool if you actually go through with it? Yup. Are you foolish enough to do it anyway? We'll find out.